The Trump administration’s decision to rescind the Deferred Action for Childhood Arrivals program could strip thousands of New Yorkers of their health insurance, a consequence unique to New York that could focus the debate in Albany when the Legislature returns in January. Attorney General Jeff Sessions announced Tuesday that the Obama-era program, which granted legal status to approximately 800,000 children brought to the United States by their parents, would begin to unwind in six months. That provides Congress a brief window to solve one of the nation’s most divisive issues. Should Congress fail, New York could face its own difficult choice: whether to continue providing Medicaid to the DACA population. There are approximately 42,000 DACA recipients in New York. The vast majority are at risk for losing their job-based health insurance if they lose their legal right to work. The Department of Health could not say how many DACA recipients currently rely on Medicaid but estimates are between 5,000 and 10,000. New York is one of the few states that provides health insurance to non-citizens, or people residing under the color of law (PRUCOL). That’s because of a 2001 Court of Appeals ruling that said denying Medicaid to any legal resident violated the equal protection clauses of the New York and U.S. constitutions. As a result, immigrants in New York who are not citizens, but are living in the state lawfully, are entitled to Medicaid. 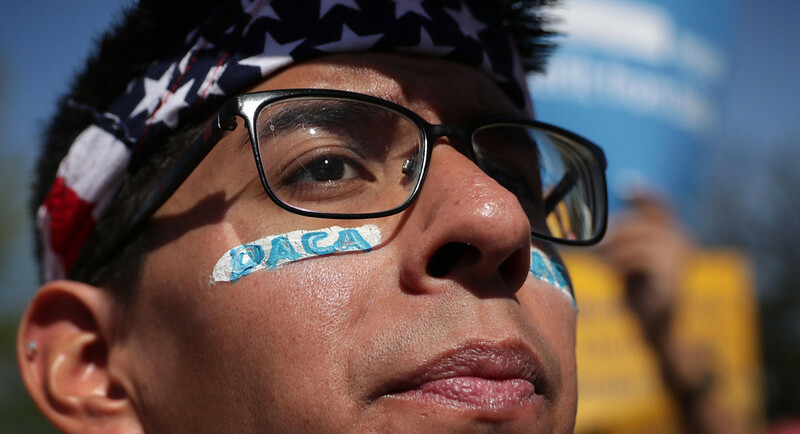 When President Barack Obama created the DACA program in 2012, thousands of New Yorkers who were brought to the United States at a young age were suddenly eligible for Medicaid. It also allowed them to pay taxes. Because the federal government does not recognize the state court’s decision, New York, which usually receives a 50 percent match for Medicaid expenses, pays the full cost for insuring these immigrants. If they lose their DACA status and revert to being undocumented immigrants in the eyes of the law, they may also lose their right to Medicaid. Elisabeth Benjamin, vice president of health initiatives for the Community Service Society and a co-founder of Health Care For All New York, said the status of these immigrants is unclear. She pointed to Trump’s statement, which said these DACA recipients would not be a priority for Immigration and Customs Enforcement. That may mean they are still residing under the color of law because they are not under immediate threat of deportation. It’s a bit of a legal stretch, but even if the law isn’t on her side, she said, Gov. Andrew Cuomo should continue to have the state Medicaid program cover DACA recipients. “I would advocate they be covered under state-only Medicaid,” she said. “That’s the $64,000 question,” she said. Presumably, this would mean helping to insure those who lose their employer-sponsored coverage and need Medicaid. In New York that would mean the state could potentially fund Medicaid for all 42,000 DACA-status immigrants. Rep. Tom Reed, a Republican from western New York, said Trump was “very wise” to recognize that DACA is not something that can be done by executive order. “That which is done by the pen can be undone by the pen,” said Reed, who favors a legislative solution that protects children brought here by their parents. The problem, he said, is how to draw the line. How can the state award Medicaid to some undocumented immigrants but not all? And if it is offered to all, then how can the state afford to cover them? While the state might have to cover more people, Benjamin drew a distinction between the DACA population and other undocumented immigrants. The DACA group, she said, has already made themselves known to ICE, further bolstering the argument the state could make that they are residing under color of law, while other undocumented immigrants are not. “It is the state who decides who is PRUCOL and who is not,” she said. This entry was posted in DACA, Health Care, immigration/deportation, Medicaid, NYS legislature, Trump and tagged DACA, New York, Tom Reed. Bookmark the permalink.